VIPAccessEXCLUSIVE: “The Last Breakfast Club” Musical Parody At The Rockwell Is The Hottest Show To Watch This Summer – Alexisjoyvipaccess RECAP! “Don’t you forget about me…” and one stupendous show that you will certainly never forget is The Last Breakfast Club at The Rockwell in Los Angeles, California taking place all summer long. We’ve all seen the iconic John Hughes movie, The Breakfast Club, and although the movie was released back in 1985, it still stands the test of time, and it’s a film that generations after generations love and cherish watching. Needless to say, when Bradley Bredeweg and Kate Pazakis put their own spin on the classic movie, the masterpiece of The Last Breakfast Club musical parody was created. Creator and producing artistic director, Kate Pazakis is truly a genius who has and continues to bring out an endless amount of awe-inspiring and terrific shows at The Rockwell. She brought “The Unauthorized Musical Parody Of” series to life with several shows including Mean Gurlz, Home Alone, Clueless, Hocus Pocus, and many others. Each show is unique on its own and has tons of excellent, musical numbers and marvelous memories. However, The Last Breakfast Club definitely does stand out as one of Kate Pazakis’ greatest and most spectacular creations thus far. The Last Breakfast Club takes a spin on the classic movie where five, polar opposite students are stuck together for Saturday detention – this time, however, the students are indeed, stuck – as in they have been stuck for who knows how long now after the nuclear apocalypse. Talk about an exciting and fascinating twist on the movie! It seems as though Andrew, Brian, Bender, Claire and Allison, along with the (hilarious!!) janitor, Carl are the only ones left – not just in the Shermer High School Library, but on the planet as a whole! The only person left to possibly help them out is Principal Vernon – who is a zombie now. Think Walking Dead meets a legendary film – it totally makes for some awesome LOL moments! In addition to a remarkable storyline, The Last Breakfast Club brings out some of the most popular, fan-favorite songs from the 80’s. The musical parody will have you jamming out to songs from R.E.M., Prince, Guns N’ Roses, Bon Jovi, Twisted Sister, Journey, Chuck Berry, Tears For Fears, and many more. This sensational, musical parody will have you smiling from ear to ear and leave you in the greatest, euphoric feeling. We’ve always wanted to time-travel and The Last Breakfast Club is the perfect way to take a step back in time to the 80’s. Of course, this show couldn’t have been made possible if it weren’t for the all-star, incredible cast which consists of profound and prolific actors and actresses known for their indescribable talents in many renowned TV, movie and theatrical projects. The brilliant cast includes Garrett Clayton, Max Ehrich, Anna Grace Barlow, Lana McKissack, and Jonah Platt as “The Brain,” The Athlete,” “The Princess,” “The Basketcase,” and “The Criminal.” Also starring in the production are Jimmy Ray Bennett as Principal Vernon and Damon Gravina as Carl. No amount of words can fully describe just how much of a phenomenal cast they are. They all have magnificent talents of their own that when joined together will truly leave you speechless. While watching The Last Breakfast Club, you can see how much passion each one of the cast-members have for what they do. Their singing voices are mesmerizing, their stage presence is impeccable, and it’s certainly a cast that can’t be beat. The Last Breakfast Club is everything and more that you could want in a perfect musical parody. The Last Breakfast Club has it all – great messages to bring out to attendees, relevant topics and issues dealt with in today’s society, and many heart-warming moments. I, Alexisjoyvipaccess had a wonderful time covering and attending The Last Breakfast Club press opening night and I can say that The Last Breakfast Club is the hottest show out this summer that you need to watch! You’re not going to want to miss out on all of the fun and you’ll definitely need to watch this amazing show not just once, not just twice, but many times – that’s just how exceptional it is! The Last Breakfast Club runs through July 22nd at The Rockwell Table & Stage – get your tickets now to watch and dine at Rockwell-LA.com. Who would’ve thought that detention on a Saturday isn’t really all that bad? 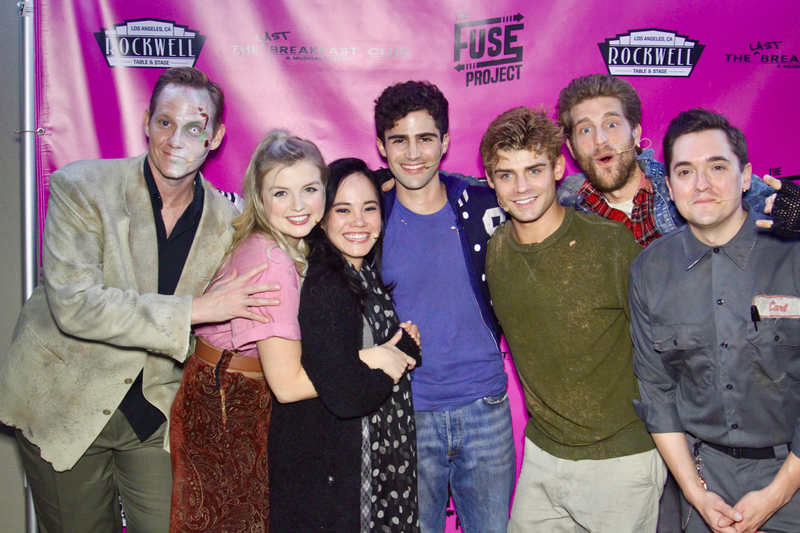 Follow @TheLastBreakfastClub on Instagram and @LA_Rockwell on Twitter and Instagram. Be sure to join in on the conversation and use #TheLastBreakfastClub and #TheFuseProject on all your social media networks! Previous Article: Get Ready For More Bikini Bottom Adventures – “SpongeBob SquarePants” Got Picked Up For A 12th Season! Next Article: Find Out JoJo Siwa’s Incredible Line Of Consumer Products With Nickelodeon Here!